In college, Martin and I were camp counselors for UCLA UniCamp, an organization that sends under-served youth to week-long sessions of summer camp run by student volunteers. In fact, that’s how we first met; we were in the same camp session – Martin as arts & crafts specialist and I as archery specialist. 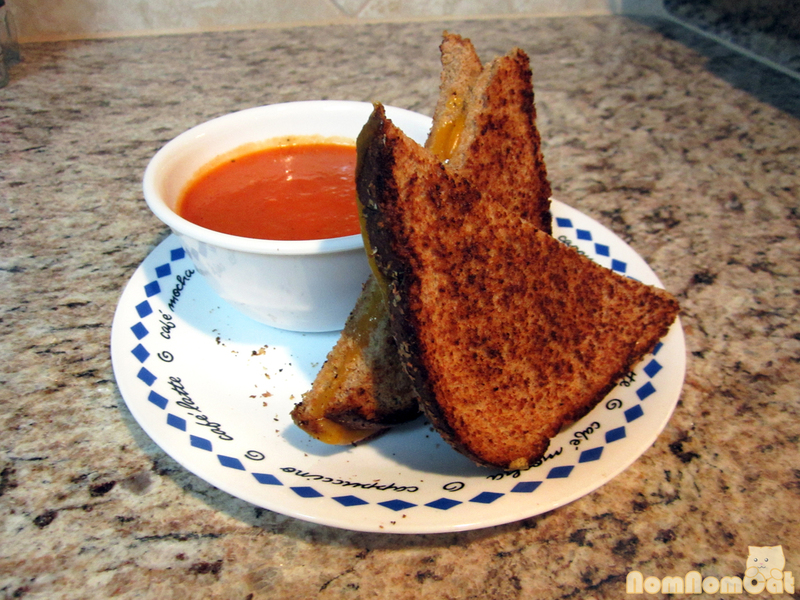 One of our (and the kids’) favorite camp meals has to be Grilled Cheese & Tomato Soup day. Crispy, gooey sandwiches paired perfectly with piping hot bowls of comforting soup, complemented by a snack of celery sticks and peanut butter! Okay, so the celery and PB are optional, but on cold winter nights, we love to whip up this classic combo. While we did not succumb to the convenience of the iconic red and white can of Campbell’s, we frequently purchased the boxed soups at Trader Joes (roasted red pepper and tomato — yum!!). 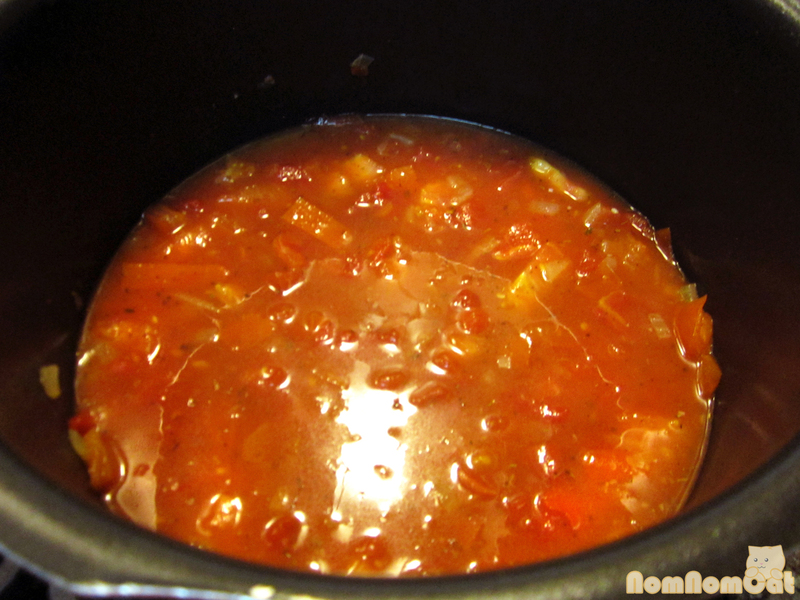 Recently, however, we started making our own soup, somewhat from scratch. The result is a rich, creamy (even without the cream!) soup that tastes dramatically better and the amount of additional effort is minimal. 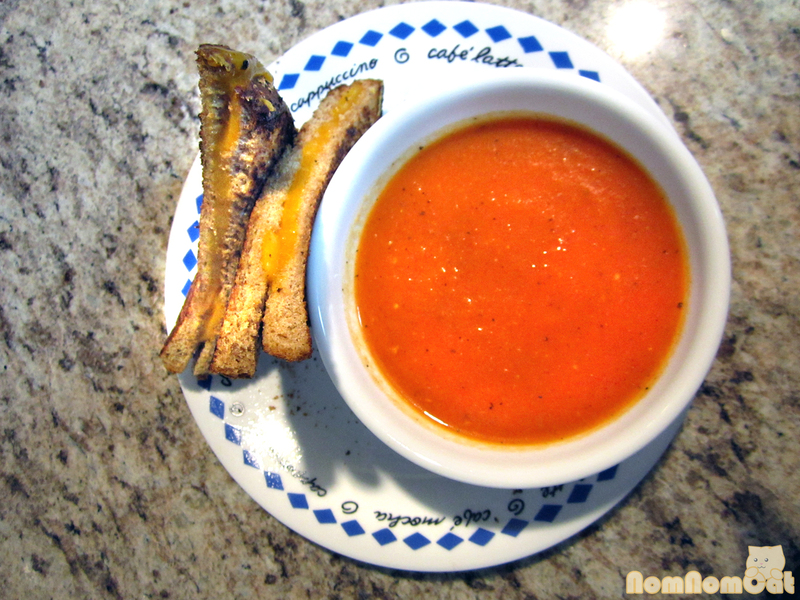 This recipe for tomato soup is quite simple – just a few ingredients and perhaps 30 minutes of your time (maybe 40 if you’re slow at prep like I am). Mince the garlic. Scrape into your stock pot. Move on to chopping the onions. Cry. Wipe tears from the corners of your eyes. Add to the stock pot. Drizzle in the olive oil and sautee on medium-high heat with a sprinkling of salt and pepper. Meanwhile, dice the fresh tomato; leave the skins on. No, don’t go for a run. 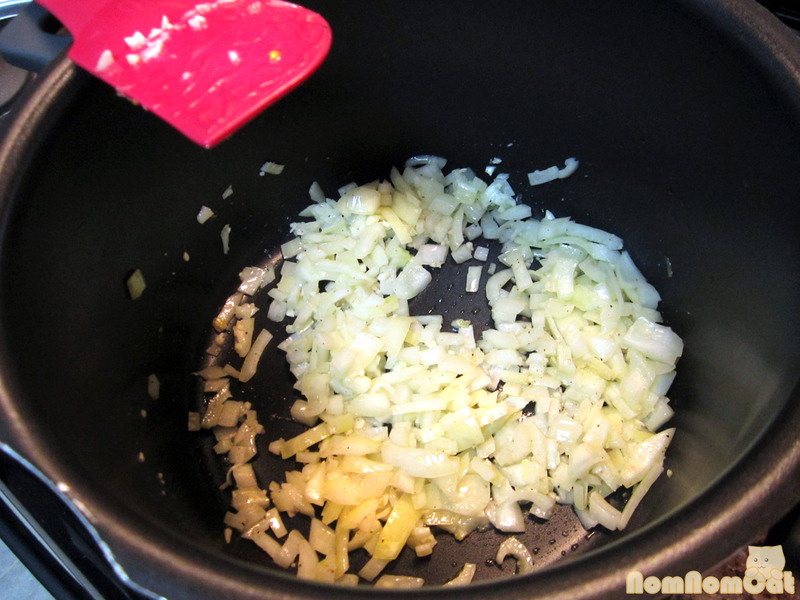 Stir the onions and garlic frequently to keep them from burning. “Sweat” the onions; cook them until they are translucent and have lost that onion-y sharpness. This may take about 10 minutes… just be patient. When you’ve got them where you want them, add the tomatoes and let them cook until the pieces start to wilt and fall apart. 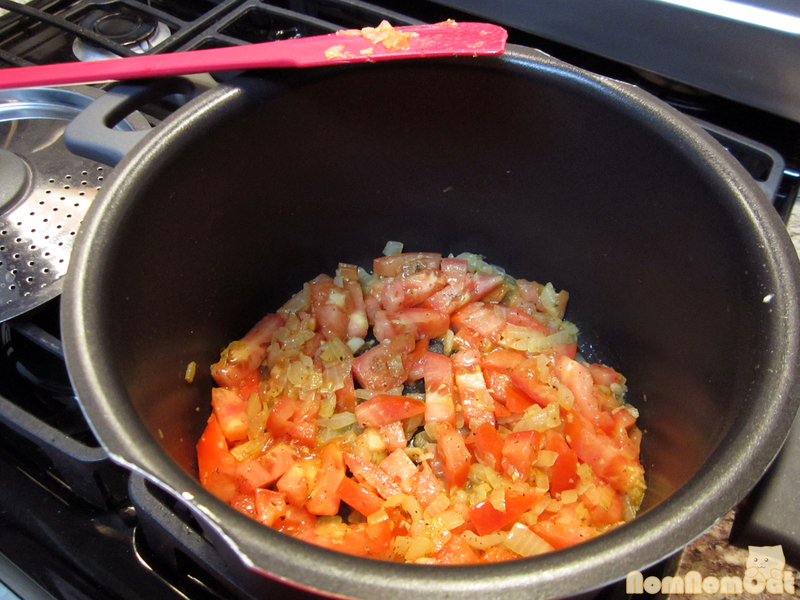 Stir the tomato-onion mixture and break up the pieces a bit. 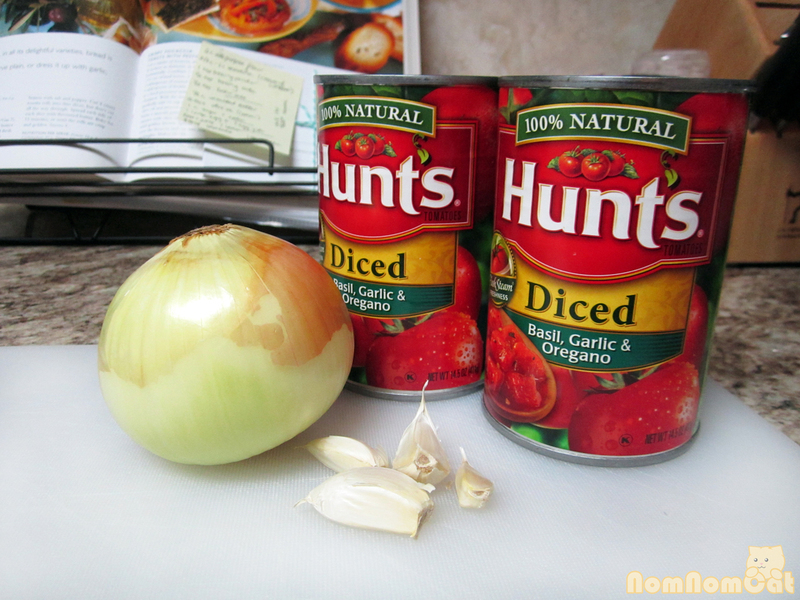 Open the can(s) of tomatoes and pour them in. Wait – don’t throw away the can yet! 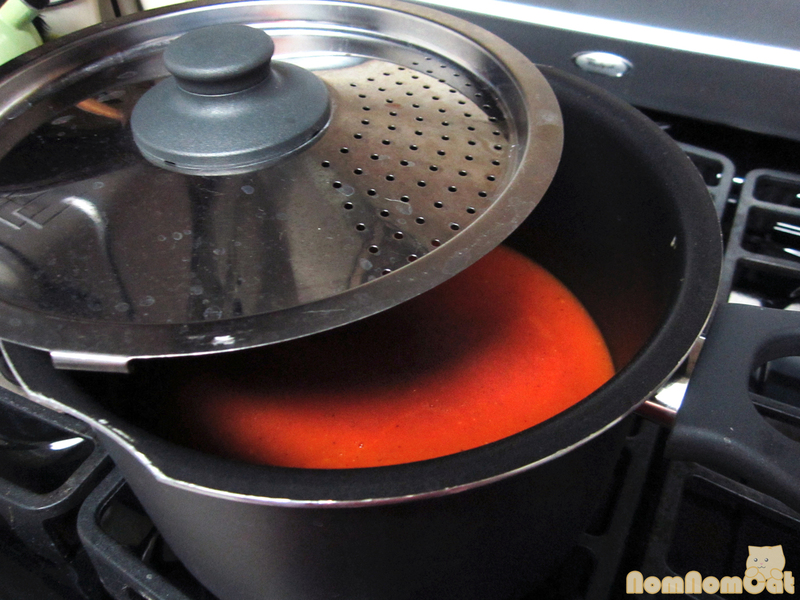 If using a 14 oz can, fill it up with water and add to the pot (if using a 28 oz can, fill halfway instead). Mix in the sugar and herbs. Season with additional salt and pepper as needed. 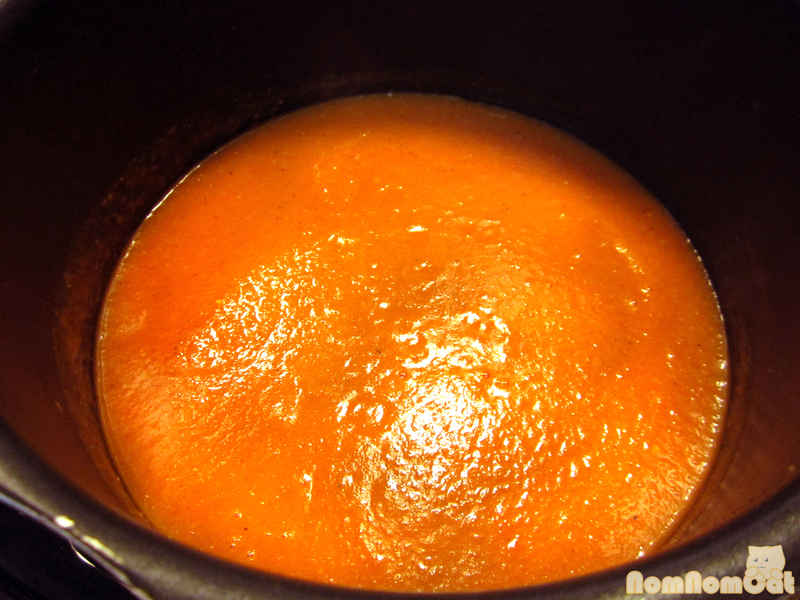 Bring to a boil and let simmer for 10-15 minutes or until the soup has heated through and the flavors have begun to meld. Take the pot off the heat. In a frying pan, melt some butter over medium-high heat until it foams and starts to brown. Gingerly place your assembled bread-cheese-bread, rotating it a bit to pick up all the buttery goodness. Toast for a minute or two. Flip with a spatula. Watch for the perfect balance of letting the cheese completely melt and not burning the bottom slice of bread. Cut into triangles and serve with a hearty bowl of soup (Steps 1-5). Voila! Thanks for revealing the camp secret, Mr. Woooo! We’ll have to try that out next time! P.S. how are grilled cheese sandwiches cooked for the masses? A giant frying pan? You know what? Rinsing the cut onion halves in cold water does help a bit. So does having a sharp knife (less bruising of the cell walls and releasing that tear gas). But I definitely couldn’t work in a professional kitchen either unless I managed to always avoid onion prep. haha. Oh and if I remember right, grilled cheese en masse: butter one side of each slice of bread, lay on a giant cookie sheet. Top with a slice or two of cheddar and another slice of buttered bread, butter side up. Stick in the oven and toast/broil. Voila!